This is a version of an editorial to appear in the Journal of Documentation. 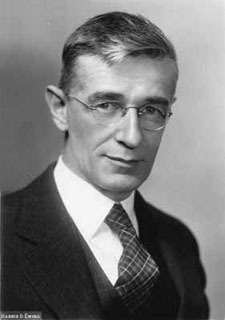 Vannevar Bush gets a mixed press these days. 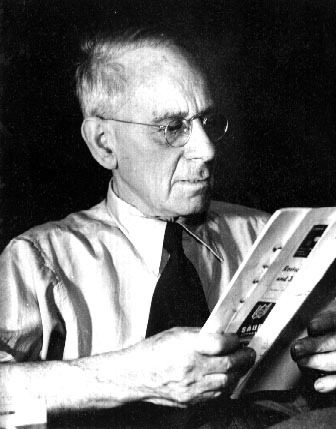 Once he was hailed as a ‘father of information science’ – some called him our ‘Godfather’ – on the basis of his 1945 Atlantic Monthly vision of Memex. This was, and in some quarters still is, hailed as a forerunner of the personal computer, the web, hypertext, and modern information retrieval in general. Revisionist authors have looked closely at this legend in more recent years. They tell us that his article was actually written in 1939, but not published until several years later. They remind us that it wasn’t about libraries and public collections at all – Bush said they were another story – but about personal collections, organised by their owner and creator according to their personal whims. The most Bush would allow was the idea of a Memex encyclopaedia or professional collection, again organised by an individual. His distaste for traditional classification and indexing is then seen into a different context; indeed, there is no need to bother with these, if you are avoiding the main purpose for which they are created. And they remind us that Bush thought in terms of microforms, even when others were considering digital computing. We are told that Bush wasn’t even that farsighted. Michael Buckland suggests that authors such as Paul Otlet, a documentalist, and Walter Schürmeyer, a librarian, had ideas about information retrieval that were more forward looking, and presented much earlier. That the, undoubtedly great, influence of his Memex article was due more to his perceived political, professional and social position than to any intrinsic merits. And that many of his supposedly novel ideas were, in fact, due to others. Michael Buckland, in a book written in 2006, has developed in detail one of these themes; that many of Bush’s ideas were previously developed by Emanuel Goldberg (1881-1970), a German/Israeli engineer and photographic scientist. In particular, the Rapid Selector device, development of which leant Bush much of his scientific authority, was by preceded by Goldberg’s Statistical Machine. Buckland traces in detail, and with meticulous referencing, the life of Goldberg, whose influence of the development of mechanised documentation in the had largely been overlooked. Goldberg’s personal and professional life – from his birth in Tsarist Russia, his training as a chemist and later a photographic scientist in Germany, his leading role in the Zeiss Ikon company, and his later career in Israeli after his expulsion form Germany by the Nazis – reflects much of the history of twentieth century Europe. Goldberg first developed a practical photographic ‘microdot’ process, for storing large amounts of information in miniature, and cameras to create such images. An enthusiastic commentator in 1926 suggested that this would allow someone to carry a library of a thousand books in their pocket. Another application is, of course, espionage. J Edgar Hoover, director of the FBI wrote an article on such usage in 1946, but replacing Goldberg’s name as creator by that of “the famous Professor Zapp .. of Dresden”; Buckland tells us that to this day Professor Zapp is still cited as the originator of microforms. Later commentators suggested the use of Goldberg’s storage devices in desktop libraries, very similar to Bush’s ideas of the Memex. 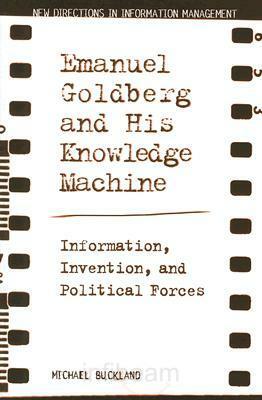 Goldberg then went on to develop a way of easily retrieving material from a collection of microforms, the Statistical Machine. This, Buckland shows, was certainly known to Bush and his colleagues. They might have been excused for overlooking it initially, when they developed their Rapid Selector; part from its name, the associated patent specification spoke of its use for ‘adding, sorting and other statistical operations’, rather than anything to do with the retrieval of information. Nonetheless, know of it they did. Indeed, explicit credit was given to Goldberg by Bush’s associate, Ralph Shaw, director of the US National Library of Agriculture, in a 1949 Journal of Documentation article describing their own device. Nonetheless, Bush and Memex were names that stuck in the popular consciousness. Buckland reminds us that Robert Fairthorne was alone, until recently, in giving credit to Goldberg for first envisaging a ‘Memex-like’ machine.